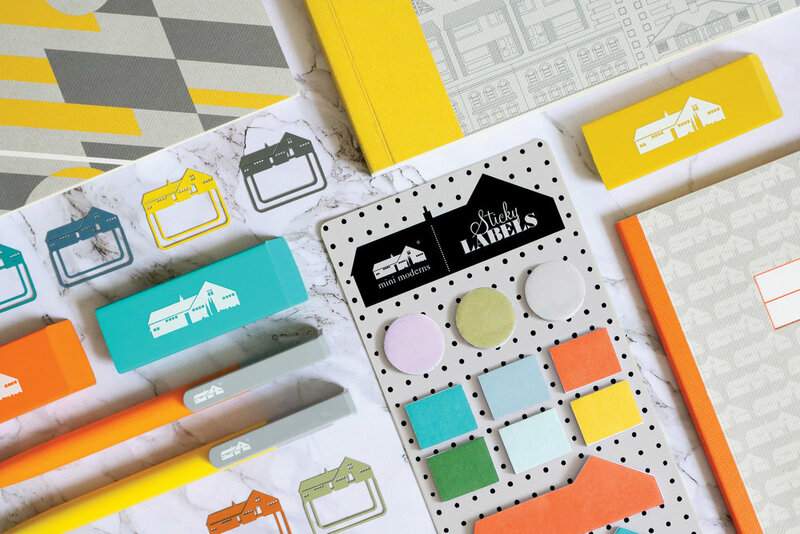 January 2018 sees British interiors band Mini Moderns enter a new product category with the launch of stationery and desk accessories. Working with stationery experts, Portico Designs, Mini Moderns have revisited some favourite patterns that have only previously been available as wallpaper. Mini Moderns founders, Keith Stephenson and Mark Hampshire, feel that stationery products have a great synergy with their designs: “Everything we do starts life as a wallpaper design, so creating a range of largely paper-based products means that there’s an instant synergy with our core home furnishing ranges”. The hero print of the collection is P.L.U.T.O. - a striking geometric design from Mini Moderns’ Hinterland collection. The stationery collection also sees the welcome return of design duo’s first ever print, Do You Live in a Town. Finally, the brand’s signature Bungalow icon is peppered throughout the range, used as a repeat pattern and as an instantly recognisable icon on zip pulls and colourful powder coated book markers. As you would expect, the home office collection features Mini Moderns signature colours, with products largely grouped in three colour blocks: Mustard, Tangerine Dream and their distinctive turquoise, known as Lido.